A toucan named Tieta had it rough. She was smuggled into Brazil illegally and had her beak broken off, either through a fight with another bird or because of how she was transported and treated while being smuggled into the country. When rescuers found her at an illegal animal fair back in March, though, they decided to give the toucan a new lease on life. 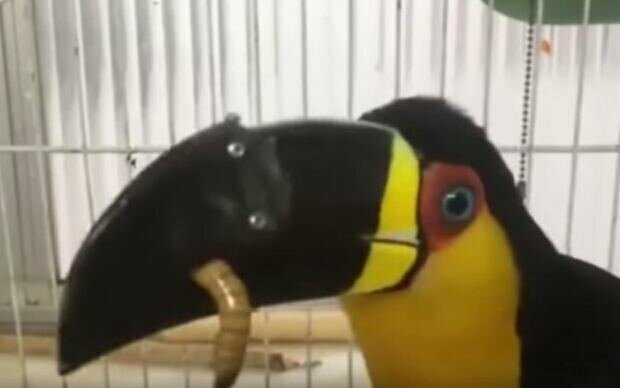 Her new beak took 3 months to design and only 40 minutes to install. Within a few days, Tieta was eating normally. Seba also said Tieta probably enjoyed the wriggly treats when she was free. “I believe she had that kind of food when she was free, before losing the beak. So it activated a core memory [allowing her to use her new beak]” he explained. Thanks to her new 3D designed polymer beak, Tieta is now on the mend and enjoying her insect snacks once again. 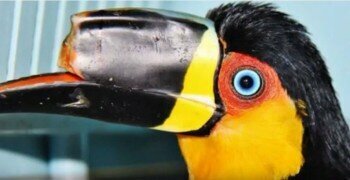 She can also get back to healthy toucan activities, like grooming her feathers with her high-tech beak.